Leonard Cohen, in his song Hallelujah, refers to “a secret chord that David played, and it pleased the Lord…the minor fall, the major lift.” Singer Anjani Thomas calls C major “the chord of Cohen.” The Hebrew word cohen means priest; Catholic priests have traditionally performed the rite of exorcism. If the major chord, which I call Deus in Musica, pleases the Lord, so the tritone, traditionally called Diabolus in Musica, may please the devil, as well as those whose wills are inclined towards evil. Debussy wrote: “People don’t like beauty because it’s a nuisance and doesn’t accommodate itself to their nasty little souls.” (in a letter to Pierre Louys, February 6, 1900; from Faulkner, 176). My strategy in this performance theme is to modulate and/or reharmonize music based on musical structures that give prominence to the tritone, resulting in an exorcism of what is traditionally called the devil’s interval. Western classical music is often perceived as the apex of musical expression. However, this musical tradition has its dark side. For example, Crystal Kirgiss notes, “Paganini was con-vinced that he wrote his violin concertos with help from the devil.” (Classical Music, 16-18) However, after describing Paganini as “an enormously romantic figure,” violinist Yehudi Menuhin states: “Music is a measure of the powers that inhabit us, be they beatific or demonic, and which we try to keep in balance and to which sometimes we yield….A musician is by nature someone who has lived and sinned, someone who remembers his feelings, his weaknesses, so that the contrition he feels and the touch of nostalgia and remorse become part of the very music he is playing and that is why it will move an audience whose frailties the musician shares.” (Compleat Violinist, 38) Tartini’s violin sonata The Devil’s Trill is based on a dream in which the devil plays for the violinist. This dark side of classical music has inspired heavy metal musicians. Thus rock producer Bob Ezrin acknowledges: “Most of the pracitioners [of heavy metal] were fans of dark classical music, like Wagner.” For example, Gustav Holst’s orchestral work Mars inspired the introduction to Diamond Head’s song Am I Evil, which begins with a bolero-like repetition of an E power chord (E with its perfect fifth and no third) played against a melody of E, B, Bb, F, E – in numbers, 1, 5, b5, b9, 8=1; this melodic riff frames the two notes of a tritone, 1 and b5, as 5 and b9 are passing tones. The chorus lyrics are: “ Am I evil? Yes I am. Am I evil? I am man.” By modulating the b5 to 4 and the b9 to 9 the chorus might also modulate, perhaps to “Am I righteous? Yes I am. Am I righteous? I’m reborn.” When the song has ended audiences may be moved to applaud, signifying their approval of these modulations. Peck “came to the conclusion that demons were powerless without human bodies – that they could speak evil only through human tongues. Were they to be cast out, they would be…utter[ly] impoten[t].” (181) Similarly, demons can only play evil music through human musicians. The Clash refers to “a clash of wills between the demonic and the exorcist.” (112) Peck believes “this to be a feature of every exorcism.” (112) The demonic wills to remain in the patient, whereas the exorcist wills to cast it out. 1.“Yes, the devil or a demonic world does exist. Martin: “The inferiority of the preternatural power of evil spirits compared to the supernatural power of Jesus is clear and definite in many of its effects. There is an opaqueness that impedes and even stops Evil Spirit – its ability to act and its ability to know – everywhere that Jesus and his supernatural power extend, where the choice has been for Jesus and where the supernatural reigns, where the supernatural invests objects, places, and people. During an exorcism “The exorcist…invokes divine protection on himself and on the possessed by making the Sign of the Cross” (The Roman Ritual Of Exorcism; from Hostage, 464); he says the following in accents filled with confidence and faith: “See the cross of the Lord; begone, you hostile powers!” Stringed instruments were traditionally regarded as analogous to the cross; therefore, this command could be declared by a guitarist exorcising the devil’s interval. 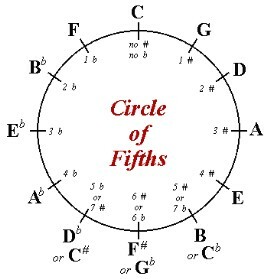 Evil spirits flee the sign of the cross, and yet the cross in both the cycle of fifths and the chromatic scale cycle outlines a diminished chord, with a tritone from top to bottom and from left to right. 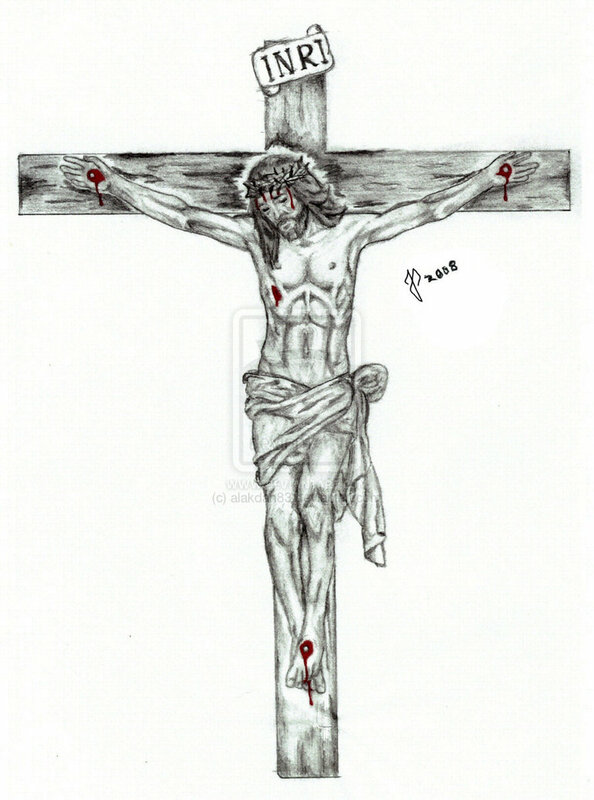 Stanley Crouch describes the words of Jesus on the cross – ‘Father, why hast Thou forsaken me?’ – as “perhaps the greatest blues line of all time.” (The All-American Skin Game, 44) “he that is hanged is accursed of God.” (Dt. 21:23) “Christ redeemed us from the curse of the law by becoming a curse for us—for it is written, “Cursed is everyone who is hanged on a tree” (Gal. 3:13) The analogous relation of the crucifix to the quadrants of musical cycles is a mystery that invites further contemplation. Jesus on the cross establishes a hierarchy, with his head at the top and his feet at the bottom. The upside-down crucifixion of Peter reverses this hierarchy. 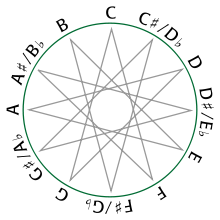 In contrast, the musical cycles can be inverted. For example, if one is playing music in the key of F#, then F# would be on top of the cycle and C at the bottom. The crucifixion is followed by resurrection to rejoin the Trinity. The dynamic of crucifixion and resurrection is manifest in a perfect cadence, which resolves a dominant seventh chord to a tonic triad. It may be that the tritone embedded in a dominant seventh chord pleases evil ears, but as Jesus became cursed on the cross (symbolized by the crown of thorns, recalling the curse of Adam, who would till thorny soil), so the inadequacy of a dominant seventh chord is revealed in a perfect cadence. As Jesus is God-forsaken on the cross, so the dominant seventh chord is forsaken of the keynote of the triad that this chord inevitably resolves to in a perfect cadence.